Sergio Perez: "It was a challenging session and it's disappointing to miss out on Q3 by such a small margin. It's been a difficult weekend so far, losing out on so much track time on a circuit where half a tenth can make a big difference. The truth is we weren't as competitive as we expected to be, but I think we can still recover to have a strong race tomorrow. We really struggled in Q1 where we had to use an extra set of tyres just to make Q2, which meant we only had used tyres when the track was getting better at the end of Q2 and we couldn't improve. I think our real pace is better than the speed we showed today and if we have a good start we will be in a position to fight for points. The weather could still play a big part, so we'll go out to try and make up some of the ground we lost today." Esteban Ocon: "It wasn't a great qualifying session. For various reasons things just didn't come together for us. We made a set-up change between final practice and qualifying and it didn't really bring the benefit we needed. So the car didn't feel ideal for qualifying. Ahead of the session, I believed we had the potential to make Q3 but it didn't work out for us. I've also got to take the grid penalty [five places] so I will be starting near the back and it's going to make the race even more difficult. 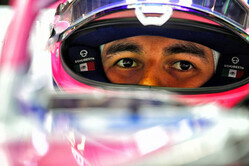 Perhaps some rain tomorrow would work in my favour and allow me to catch up and fight for points." Otmar Szafnauer: "We've been a little bit on the back foot all weekend with a lack of track time for Sergio and chasing the set-up with Esteban. With those challenges, Q3 was just out of reach today, especially on such a short lap where a few rows of the grid are covered by a few tenths of a second. Let's see what happens in the race. I think we can be more competitive than today with the potential to score points."